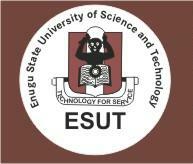 The management of ESUT wishes to remind the entire University community that academic activities for 2016/2017 academic year commenced on Monday 10th October, 2016. In view of the foregoing, all continuing students are expected to have registered their courses after paying the appropriate fees for the academic year into the designated banks. For purposes of clarity, students that fail to register their courses for the semester will have a score of zero i.e. (F) in the courses for the semester and such students will be made to face Examination Malpractice Committee, as participation in examination in a course not registered for by the student amounts to examination malpractice. Students, who have not paid, have up till 13th January, 2017 to pay their fees and register their courses without penalties. Please note that there has been no fee reduction. Late registration during the first week attracts a penalty of N10,000.00, while late registration after the first week will attract a penalty of N15,000.00 only. Registration closes six (6) weeks from commencement of late registration. Orientation/sensitization will hold on February 22nd, 2017, at Prof. Julius Onah Auditorium, Agbani, for Faculties/Departments in Afbani Campus at 12noon. Eligible students who are not registered within this period are advised to apply for deferment of admission (for fresh students) or voluntary withdrawal from the University (for continuing students) in order to qualify for registration during the next academic year on procurement of re-admission form of N5,000.00. Students who fail to properly defer their admission or obtain approval for voluntary withdrawal from the University will be deemed to have processed themselves out of the University.